You know, the names of Egyptian Gods have been thrown around a lot lately when it comes to naming various PC cases and assorted computer accessories. However, the occasional few rise up to the challenge and truly live up to their namesake. Such is the case with the Hiper Osiris. This Black Aluminum Mid Tower Case is named after the ancient Egyptian god of the overworld, and commands such a high level of design and performance that it makes its many competitors pale in comparison. 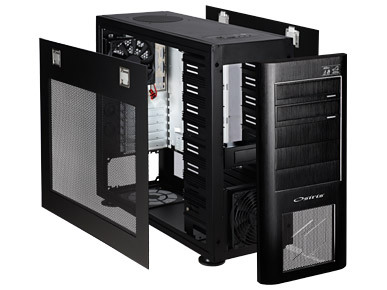 Constructed for "no tools" assembly with an innovative airflow concept, the Hiper Osiris Aluminum Mid Tower Case places the Power Supply at the bottom with a direct fresh air intake, so the heat of the PSU is completely isolated from the case. 120mm fans with 3pin plugs are located on the top and back of the case for connecting the motherboard, with the third 120mm fan located on the front HDD Modular-Rack. In addition, three PCI air ventilation plates are also included, providing better exhaust capability for SLI or Crossfire-equipped systems. The Osiris also supports all XL ATX PSUs and graphic cards. Featuring a luxurious brushed black exterior, the Osiris contains a function panel with various USB, eSata, and audio ports that are ideally placed on the front top side. Adding to it's charm are the diamond laser cut buttons, plugs and front side. Rounding out it's unique construction is the frame itself, which is made of 6063-T5 military spec alloy and offers outstanding heat dissipation. All in all, the Gods must be crazy to offer a case like this to mere mortals like us. *As an exclusive bonus, the Osiris case includes a limited edition key ring with the unique serial number of the case supplied inside. Material: Aluminum Dimensions: 20.7" x 8.0" x 17.8"
External: 5 x 5.25", 1 x 3.5"